For some reason this game gets good replay in our group - it is a clever little card game with good mechanisms (that take at least 1 game getting used to - the game confused me as well when I first played it!). Each player tries to gather dinosaur eggs in different colors, even better: of the SAME color, as their net worth will be squared (so 3 eggs of the same color give 9 points). Each turn two eggs are revealed randomly, the player who played the highest card in the final round of card play gets the first choice of "egg", the second gets the remaining one. The LAST player will be able to alter trump OR losing suit for the next round. In a 4-player round, the 3rd player will get nothing, which is usually to be avoided, as the ability to change trump suits is actually pretty important in the end game. Each player has exactly the same number of cards, numbered 1-15, but in 5 colors (so 1 color has the 1, 6 and 11, another color has the 2, 7 and 12 and so on). There are also two special cards (more about them later). You start with only a selection of cards, the others come into play through drawing additional cards from your private draw pile, to which about half of the cards you will play enable you. The brown "8" gives you 3 new cards for example. The other half of the cards are "comet" cards: these start the last round of card play, starting from the player who played them (this last round will determine the "winner" of the current turn), but only until somebody plays a HIGHER comet card, which starts a new round. So it is possible to prolong the last round a lot of times, which is usually what happens. Playing the same card as your predecessor actually beats his/her card. But as you never really know when exactly the round will end (players might also play one of the special cards, the "super comet", which beats all other comets) it will also be in your interest to play a card that is the highest in the current round. And if you played the highest comet you also have to play an additional card for your final play - if it is also a comet, it could prolong the current round…again! For this problem you can use the "chameleosaurus" card, which enables you to imitate the card you play it on, without copying its comet or card draw abilities. If yellow is the trump color you could first play the 11 comet card (which is the highest yellow card), and then, as the final card play, the chameleon, which is again the yellow 11, but doesn't start the new round. 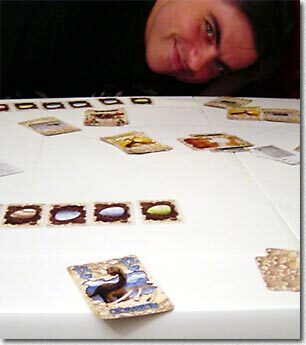 Another mechanism makes the game interesting: After one round is finished, each player either removes the visible card of his discard pile, or an unknown card from his draw pile. The discard pile is then turned over and placed under the draw pile. Therefore you have to memorize your cards, as they will reappear in exactly the same order. You'll also have to memorize the cards the other players lose, as they will determine who is leading in one or the other color. The game ends when the number of available cards reaches a certain limit, the player with the highest net worth in eggs wins. The challenge in this game is to judge when you start the "final" comet round: sometimes, if your hand is better than the other player's hands, you should push early to exploit this advantage, if you have few cards, you might play the "card draw" cards first. But you might miss the end of the round, which sometimes comes earlier than you think, when players refuse (or are unable) to play higher comet cards to continue the round. Very often an unexpected card play of your neighbor can ruin your best plans! 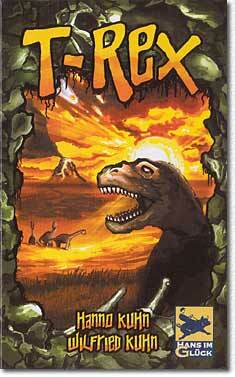 "T-Rex" is a challenging and interesting card game - it takes time to get used to, but it is definitely worth the effort. 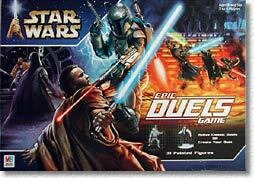 Peter and Andrea played Emperor and Count Dooku (their favorite combo), Loredana and me poor Mace Windu and Yoda. 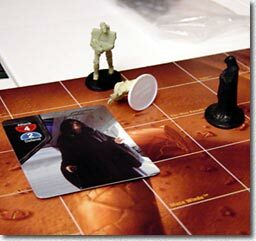 As was to be expected the dark side had a big advantage by stripping Mace of his carefully collected cards. They concentrated their efforts on Mace early on, which enabled Yoda to hold back a little and collect useful cards. Although Mace was able to damage Count Dooku considerably he couldn't prevent being killed - sadly the clone troopers didn't fare better. Yoda was able to give Dooku the finishing blow, but Dooku's robots had survived and annoyed the hell out of Yoda with sneaky shots from the distance. In the end Yoda was only able to scratch the emperor (who simply healed himself again and again), and succumbed to the concentrated use of the emperor's "3 damage cards".